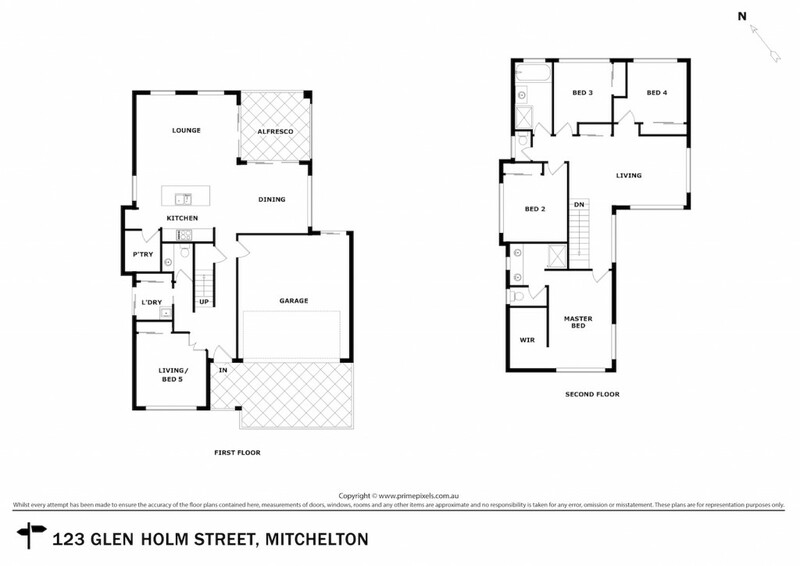 Presenting 123 Glen Holm Street, Mitchelton. Built to the owner's exacting standards, this brand new contemporary residence resting on a substantial 653m2 parcel of flat, prime land offers something truly unique. Spread over two generous levels, the home offers style and space with multiple living areas. Downstairs offers an open plan kitchen, dining and lounge area flowing out to a covered alfresco - the perfect area for year-round outdoor entertaining. Positioned at the heart of the home is the eye-catching kitchen boasting Caesarstone bench tops, walk-in pantry and stainless steel appliances including a 900mm wide DeLonghi oven with gas cooktop. Also featuring downstairs is a separate living room suitable for use as generous fifth bedroom plus a powder room. High 2590mm ceilings, extensive use of windows, glistening porcelain floor tiles and crisp, clean lines work perfectly to create an elegant space of timeless appeal. Offering striking street appeal, number 123 is sure to be the dream package that you've been searching for! Conveniently located in the heart of Mitchelton, just 9kms approximately from the City, and walking distance to bustling Blackwood Street, Mitchelton Train Station and Brookside Shopping Centre - position is simply perfect.